This article is extremely useful and important. Because the first thing you should know, if you’re looking for a good Bali surf advisor is surf etiquette! Even if you know some rules, read it one more time to make sure you remember all of the rules. If you’ve never read it before, well, read it 5 times a day 7 days a week while you’re brushing your teeth, taking shower, having lunch and before you go to bed! 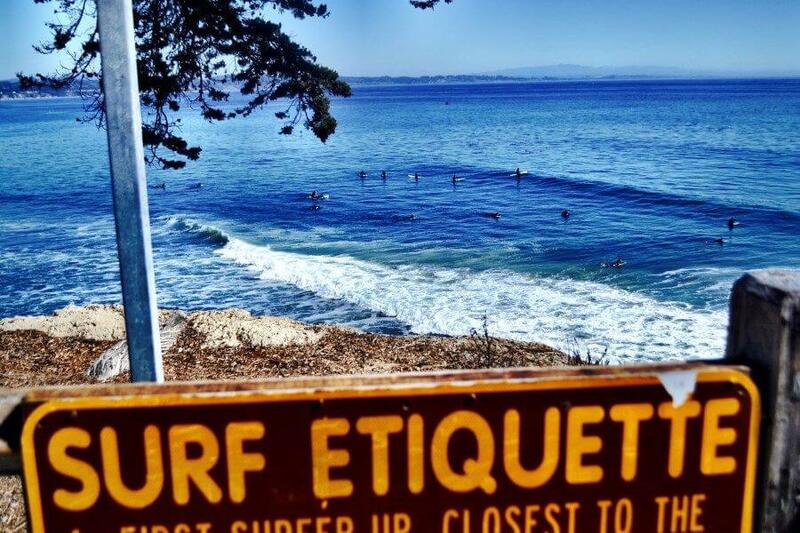 Nowadays, surf etiquette is more like safety rules plus you won’t look like an idiot in a lineup. Why it’s chapter number one of Bali surf advisor? The answer is because this place is getting more and more popular for tourists and surfing. People from all over the world come here to try surfing, but unfortunately some of them don’t even have a clue about any rules of surf etiquette. It’s been created over several decades ago, when surfing came out of the underground and become official culture. Lineup got busier, so surfers needed some regulations to avoid injures and conflicts. Also it helps judies during surf contests. On a picture you can see two surfers. The right one is already on his board and the left one is just about to get on it. And it’s clear that surfer #1 is much closer to a peak then the left one. 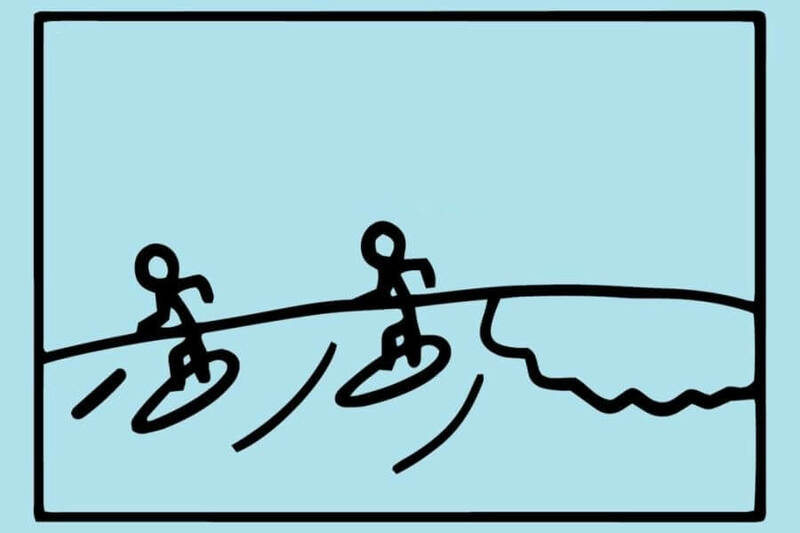 Even if the left surfer would’ve got on his board first, he has to yield to the closest to a peak surfer. So yes, our advice to the left surfer – don’t even think about it! Some time ago, before shortboards were created, this rule was like ‘the fastest paddled out get a priority’. But it worked on only with longboards, as soon as shortboards appeared in surf world, it wasn’t fair: longboard riders had more priority due to this rule. The rule has been transformed. Some of ‘bad guys’ still ignore a new rule and follow old one, particularly on small waves. We think that there is only 1 right rule: a wave belongs to whoever is closer to a peak. If you see an A-frame wave, that breaks 2 sides – left and right, just watch out where a peak is and what side of it you are on. Just like yo see on the picture. 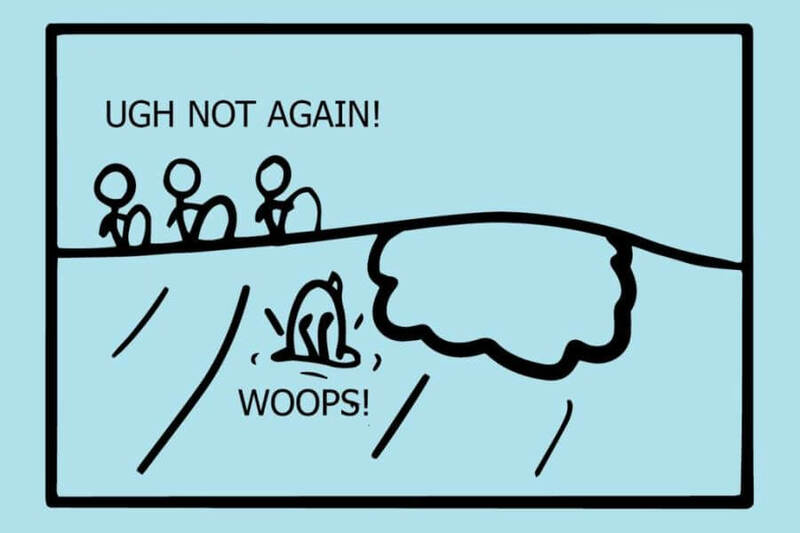 You are on the left side of a peak – go to the left, if you are on the right – to the right. 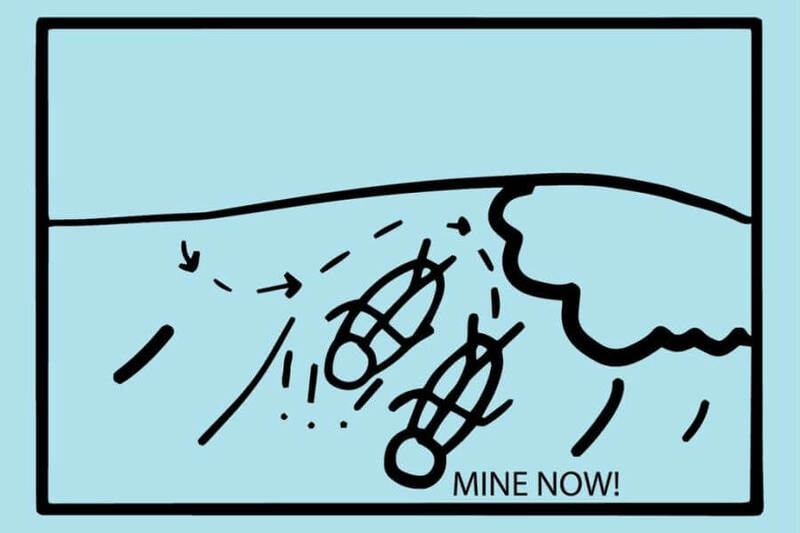 To make sure you will avoid a collapse just say to another surfer what side you’re going to. In case if you are already on the way to each other, the one who surf worse shout get of the way, if you are a beginner leave a wave and go straight. Do you want to enjoy surfing without disturbing anyone around? Choose a surf spot wisely, go to paces suitable for your level and don’t overestimate yourself. If you are scared of big waves, but want to try it – wait for time you will feel that you are ready. If you can’t take off on a steep wave, choose a spot with more mellow waves. Sadly, some surfers overrate themselves or just do it wrong. Potentially, it can be a reason of some injures for them or people nearby. Before going to a spot and in water, read features of a spot, look at a waves’ size and what level of surfers that are out there is. Ask yourself, are you able to fit in or it’s too much for you? ‘Drop-in’ – means to take off in front of someone who is already on the same wave or to take off the same wave with someone who has priority. It’s a rudest thing you can do in surfing. And it can end up unpredictable: you will look like a royal moron and get some how-to-surf advices or you will be bashed out of the water with broken surfboard. To drop-in on someone can cause a trauma for both of you. So if you don’t understand importance of following this rule, surfing is not for you. When can drop-ins happen by an accident? If a surfer with priority fell of his board you have all rights to take this wave, BUT you have to be 100% sure that he fell off. What to do if it happened? We all make mistakes, and even if you’re experienced and polite surfer, it still can happen. The first thing you HAVE to do is to apologize, especially if other surfer lost his wave because of you. If you just took off and see someone on a wave behind just get off it. Don’t jump off a surfboard – your board still will be an obstacle or, even worse, will hit a surfer behind. How to react if someone dropped-in on you? If it is local, just forget about it and pretend nothing happened. Sooner or later you will get your wave, but don’t forget that it’s his home spot. Sometimes they get extremely jealous about new people and crowds on it so do it on purpose. Waste your time fighting with white water. If a spot is for advanced surfers, you can easily lose a board, break a leash etc., so you will float around by your own. What to do if you surf a beach break, where there is no channels but there are a lot of peaks around? First of all, try all your best to avoid other surfers. That means, if you are on the way back to a line-up and see a wave with a surfer in front of you, paddle to white water. 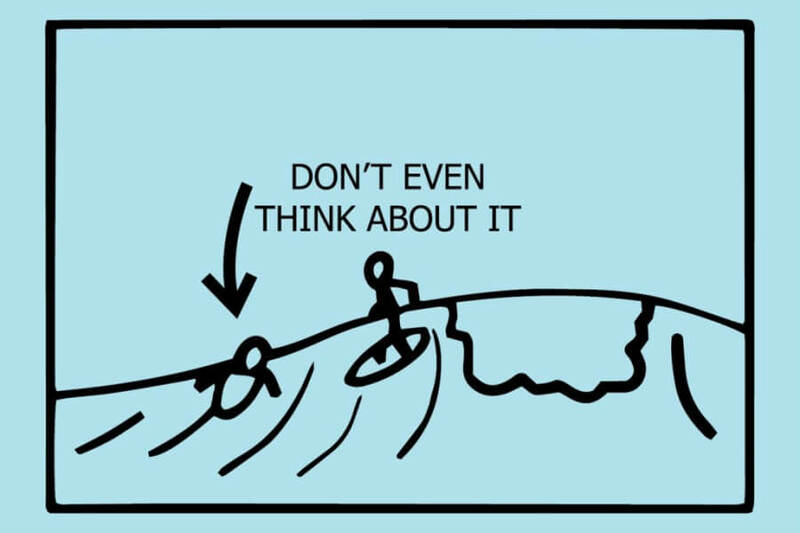 Or, if it’s too late, paddle as fast as you can, so maybe you will to sip through before bumping into a surfer (don’t forget to watch out your legs though). Bali surf advisor in this case for beginners – if you are not sure, that you can make it, just stop and let the other surfer know that you are right there and let him just go around you. 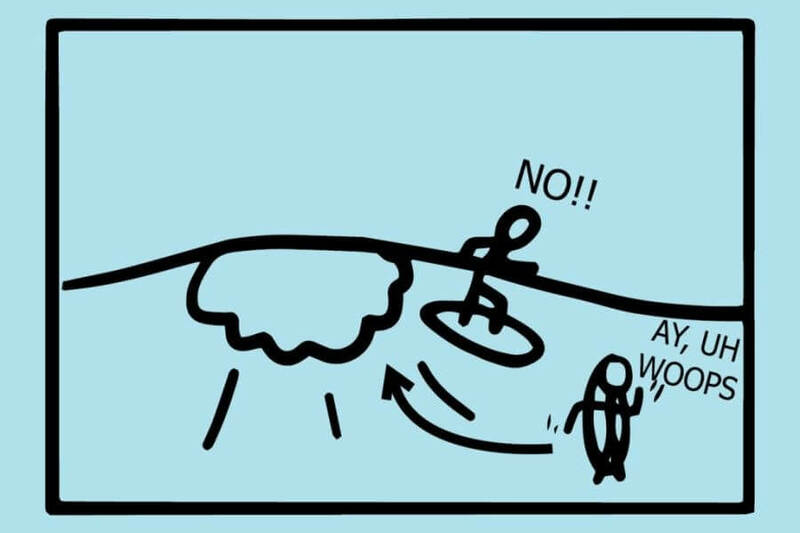 Unfortunately, that might not work, because the other surfer can be not able to see or understand you, or just not skilled enough to turn around you. So if you couldn’t help to avoid an accident, just say sorry and ask if anything is ok.
Surfboards are dangerous thing. Some of them are extremely heavy; others have a sharp nose or fins – so all of above together can hurt you very badly. 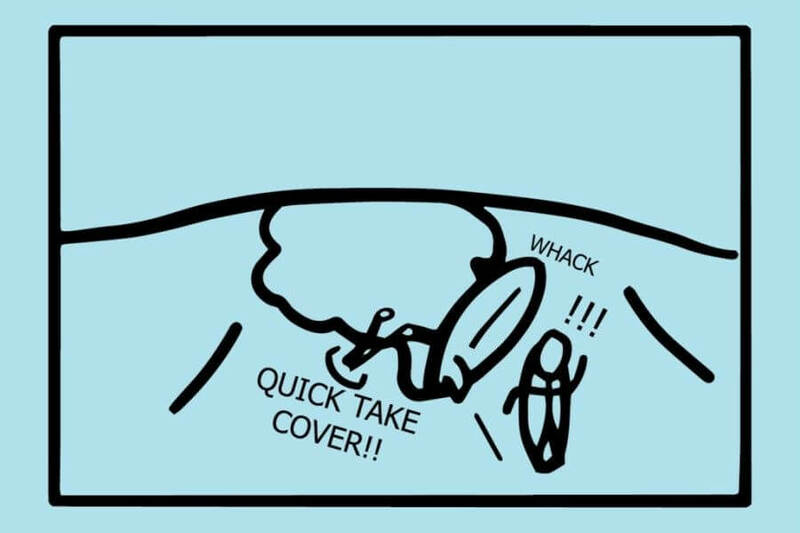 The most terrifying moment is when you or someone around losing control under a board. That’s why never make a sharp turns or airs or other professional manures being close to other surfers. Also never throw your board away when paddling out to line-up. You will still have a chance to hurt yourself by your own board plus you can hurt someone else. How can you help it? Don’t stress and work on your escimo-roll or duck dive skills. Moreover, look after who is in front and behind you, it a part of surf etiquette. 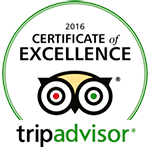 So Bali surf advisor mainly is based on paying attention to what is going on around you. Don’t paddle right in front or behind someone, try to stay aside so you will be able to stay safe when a set suddenly comes. Snaking means to steal priority from another surfer, paddling around closer to a peak. It’s very similar to dropping in, same rude and can also end up with arguments and fights. Don’t be a meanie – share, don’t scare! Even if you are the best one in a line-up and can easily get any wave, it doesn’t mean you should do that. Respect others and let them enjoy it as well. Remember yourself back in times, when you just started surfing, would you like to deal with a ’know-it-all’? 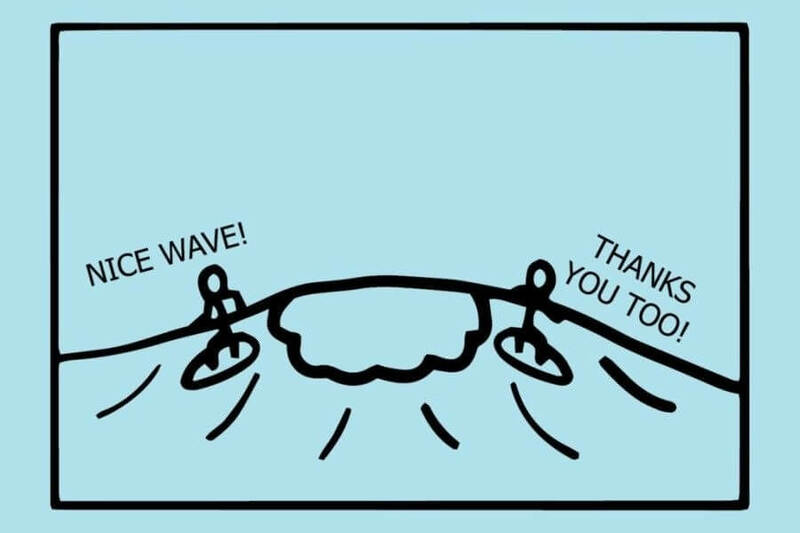 Waves are for everyone! If you ride a longboard, we’d like to remind you, that the rule of priority has been modified. So another thing Bali surf advisor is based on is respect. By locals we mean, first of all, local surfers, who grew up next to a surf spot and have been surfing there a while ages before you. Some of them are friendly, but some are jealous. They drop in on you, like snaking a wave, be rude and do whatever just to make you feel uncomfortable, so you won’t come back. Maybe it’s hard to swallow it and act cool, but you should try to understand it first. Since you weren’t born there, you are kind of invader for them, you make a crowd on someone’s home spot. So if there is a local bully in a line-up, who makes your surfing difficult, don’t try to argue and claim your rights. As soon as you try to do that, nothing good is going to happen. And if there are more locals then tourist are out, sometimes it’s better to go to another spot. It takes only one sneaky local and one stubborn not-local to start a huge fight between all of people in a line-up. Trying to argue with one local will turn out as fighting with all of the locals around. And you will be grateful if they break your board, not a nose. Yes, maybe it’s way too much, but as we said before, you should try to understand them and show them respect. Bali surf advisor also provides assistance to others. Always take care about people who are next to you. If someone is in a rip current but doesn’t understand it – tell him or her about it, help them to get to a safe place (of course, only if you feel confident that you can do that). If someone loses a board, catch it if you can or take a surfer to it. If anything bad happens – do not be indifferent. After all, one day, who knows, you might need some help as well, and you will need someone to help you. And finally: respect the ocean, other surfers, a beach and a surf spot, do not leave any trash after you, and always enjoy the ride and let the others enjoy it as well! It’s just like one of the pioneers of surfing, Duke Kahanamoku, said: “The best surfer out there is the one having the most fun “. This phrase sums up Bali surf advisor.